Hailing from Escondido, North San Diego County, CA, Stone Brewing Co.'s flagship beer, their Pale Ale, is a mighty good beer. The original east coast deserter would probably be better at reviewing this one, but I lived in NorCal for three years so I have some experience with the left coast and feel somewhat qualified. I cracked this one open after a long day at work when I actually did work that day, and let me tell you, it was one hell of a treat. I wouldn't drink this out of a snifter, but the lovely odor coming out of the bottle was striking and I made sure to enjoy it before taking a sip. This is a Pale Ale, so its kind of bitter. Not bitter beer face bitter (F U Keystone), but deliciously hoppy bitter. Not nearly as hoppy as an IPA, but hoppy enough for an IPA fan like myself to enjoy. It ranks in at 41 IBUs. I read on wikipedia that the technical max for IBUs is 100, but that some brewers will try to brew beers that surpass 100. To do this, brewers sometimes use the tears from uber-bitter Penguins fans after the Pens lose a game 7 AT HOME to the Lightning in the playoffs. Or a single drop of saliva from Indians fans after the Tribe blew a 3-1 series lead to the Red Sox in the 2007 ALCS will do the trick. I STILL HATE YOU JOEL SKINNER!! WTF DIDN'T YOU SEND KENNY LOFTON HOME!?! MANNY WAS WALKING TO PICK UP THAT BALL!!!!! Stone Pale Ale has the typical pale ale - hoppy beer taste, which leaves a nice flavor in your mouth. I wouldn't recommend having one with enchiladas though, which I did - la comida mexicana no va bien con esta cerveza. This is a beer meant for relaxing, sipping slow, and enjoying life. I would definitely drink one while watching someone's kid play T-ball. And at 5.4% ABV, it gives a nice buzz, if you are prone to buzzes after half a beer (guilty as charged). 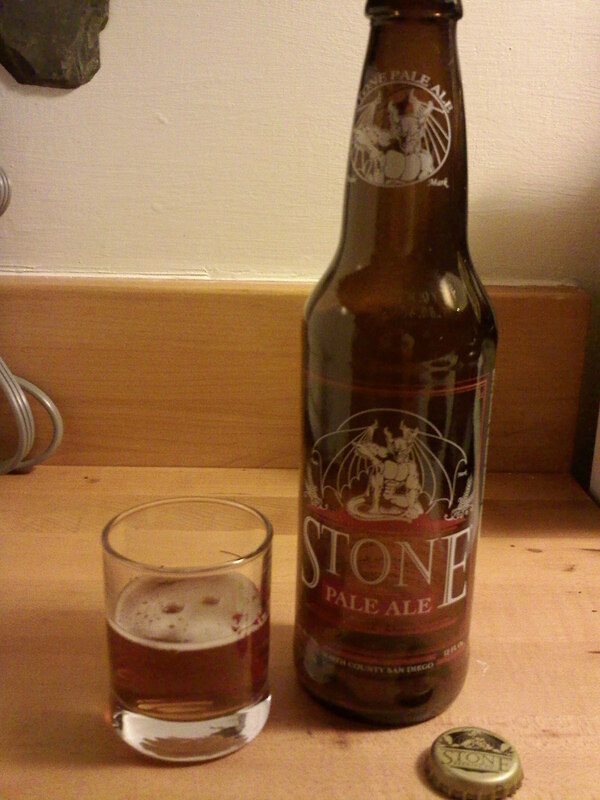 Plus, there is a gargoyle on the bottle, and who doesn't like gargoyles? At $10 a six pack, its a bit pricey, but I was able to pick up a single 12oz bottle at Whole Foods for $1.79, so I ain't complainin'. Overall though, great taste, great flavor, and one that I will be returning to on a regular basis.